Figure A. FITC conjugated hamster anti mouse CD11c (MCA1369F) and Alexa647® conjugated rat IgG2b isotype control (MCA6006A647). Figure B. FITC conjugated hamster anti mouse CD11c (MCA1369F) and AlexaFluor647® conjugated rat anti mouse CD11b (MCA74A647). All experiments performed on murine bone marrow in the presence of murine SeroBlock (BUF041A). Rat anti MouseCD11b antibody, clone M1/70.15 (MCA74G) used to identify murine microglia in vitro by immunofluorescence. Immunocytochemical characterisation of cultures of mouse microglia. 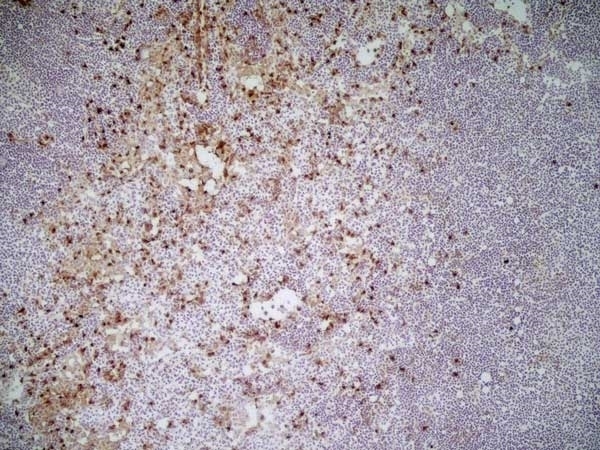 Cultures of microglia were immunostained with anti-CD11b (a) and anti-GFAP (c). Cultures of astrocytes were immunostained with anti-CD11b (c) and anti-GFAP (d). All cells were also counterstained with DAPI (blue) to identify the cells' nuclei. From: Ferger AI, Campanelli L, Reimer V, Muth KN, Merdian I, Ludolph AC, Witting A. Effects of mitochondrial dysfunction on the immunological properties of microglia. J Neuroinflammation. 2010 Aug 11;7:45. HCT1026 inhibits MPTP-induced increased reactive Mac-1+ microglia in striatum and SNpc. Ageing (9-11 month-old) C57Bl/6 mice fed with a control (ct) or HCT1026 diets (30 mg kg-1) starting at -10 d, underwent an MPTP treatment, as described. At different time-intervals mice were anesthetized and rapidly perfused, the brains processed for immunohistochemistry. Coronal sections at the level of the striatum and SNpc were stained with Mac-1-Ab to localize microglial cells. A-B: Reactive (ameboid-like) microglial cells were counted at different time-intervals after saline and MPTP injection (n = 4/experimental group) in mice fed with a ct or HCT1026 diets, within both Str (A-G) and SNpc (H-N). Differences were analyzed by ANOVA followed by Newman-Keuls test, and considered significant when p <0.05. **p <0.05 vs saline; *° p <0.05 vs MPTP mice fed with ct diet. B-E: Representative confocal images of Mac-1 staining (green) in saline (B), 3 d after MPTP in mice fed with ct diet (C, 20× and D, 40×) or HCT1026 (F, 20× and G, 40×). Insets (100×) show microglia morphologic appearance. I-N: Representative confocal images of Mac-1 staining (red) in SNpc. Note the high density of reactive Mac-1+ cells with rounded cell bodies and short, thick processes 3 d after MPTP administration in mice fed with a ct diet (J-K), as compared to Mac-1 microglia of mice fed with HCT1026 (M-N), exhibiting a more elongated cell body and long ramified processes. From: L'Episcopo F, Tirolo C, Caniglia S, Testa N, Serra PA, Impagnatiello F, Morale MC, Marchetti B. 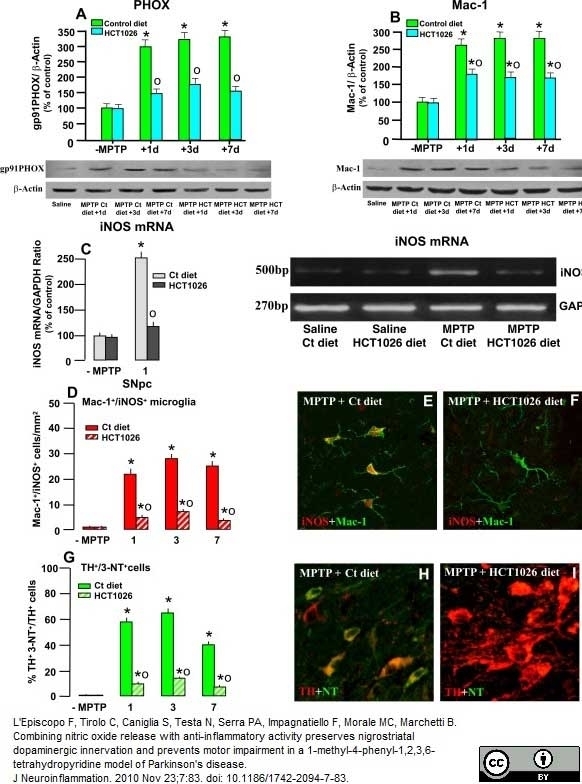 Combining nitric oxide release with anti-inflammatory activity preserves nigrostriatal dopaminergic innervation and prevents motor impairment in a 1-methyl-4-phenyl-1,2,3,6-tetrahydropyridine model of Parkinson's disease. J Neuroinflammation. 2010 Nov 23;7:83. HCT1026 inhibits MPTP-induced increased Mac-1, PHOX, iNOX and 3-Nitrotyrosine expression in SNpc. 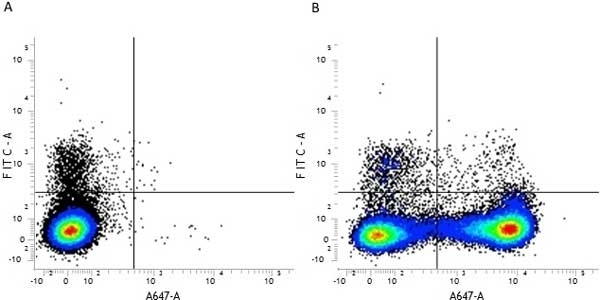 A-B: Western blotting of phagocyte oxidase PHOX (A) and Mac-1 (B) within the VM at different time-intervals after saline or MPTP injection in mice fed with the control or HCT1026 diet. The data from experimental bands were normalized to β-actin, before statistical analysis of variance. Values are expressed as % of saline-injected controls. Differences were analyzed by ANOVA followed by Newman-Keuls test, and considered significant when p <0.05. * p <0.05 compared to saline; ° p <0.05 vs MPTP fed with the control diet. C. Semi-quantitative RT-PCR for iNOS. The 250 ng of cDNA were used for PCR, by using Super Taq DNA polymerase with specific primer pairs for iNOS (500 bp) and Classic GADPH Standard (270 bp). Samples from PCR reactions were processed as described. Fluorescent bands of amplified gene products were analyzed, the values normalized against GADPH and ratios expressed as % of control, within each experimental group (C), see text for details. Differences were analyzed by ANOVA as above. ** p <0.05 vs saline; ° p <0.05 vs MPTP + control diet. D: Mean numbers of Mac1+iNOS+ cells within the SNpc in saline and MPTP mice fed with the control or HCT1026 diet. Cell counts obtained as described in Material section. E-F: Representative confocal images showing double staining with Mac-1 (green) and iNOS (red) in MPTP mice fed with the control (E) or HCT1026 (F) diets. G: Percent (%) of TH+ neurons colocalizing with 3-nitrotyrosine (3-NT), a peroxynitrite footprint. Dual stained TH+ 3-NT+ neurons were counted as described and values expressed as % of total TH+ neurons. H-I: Representative confocal images showing dual immunostaining with 3-NT (green) and TH (red) in MPTP mice fed with a ct diet (H) showing that a large proportion of DAergic neurons colocalize (orange-to-yellow) as opposed to TH neurons of mice fed with HCT1026 (E) where no colocalization was observed in the large part of SNpc neurons. Rat anti mouse CD11b antibody, clone M1/70.15 (MCA74G) used for the assessment of CD11b expression by activated N9 microglial cells using immunofluorescence. Localization of CD11b and p-STAT3 immunoreactivity in activated N9 cells. Experiments were performed as described above. Confocal immunofluorescence microscopy was performed on cultures that were immunoreacted with antibodies against phospho-STAT3 tyr705 (left, rabbit monoclonal, 1:100; FITC-conjugated sheep anti- rabbit secondary, 1:200) and CD11b (right, as Figure 1 shows) at 12 h after EMF exposure (A-L). (A-C) Untreated cultures were used as a control. (D-F) Cultures pretreated with P6 (10 μM). (G-I) EMF induced more phosphorylation of STAT3 (green) and expression of CD11b (red) in N9 cells. (J-L) P6 inhibits the phosphorylation of STAT3 and expression of CD11b at 12 h after EMF exposure. (M-O) P6 pretreatment significantly suppresses the phosphorylation of STAT3, but a slight and significant increase of CD11b is still apparent at 3 h after EMF exposure. Scale bar 10 μm. (P) Bar graphs show semi-quantification of fluorescence intensity for p-STAT3 and CD11b in N9 cells. Results are presented as mean ± S.D. of three independent experiments. Statistical comparisons to control are indicated by * p <0.05; ** p <0.01. From: Yang X, He G, Hao Y, Chen C, Li M, Wang Y, Zhang G, Yu Z. The role of the JAK2-STAT3 pathway in pro-inflammatory responses of EMF-stimulated N9 microglial cells. J Neuroinflammation. 2010 Sep 9;7:54. 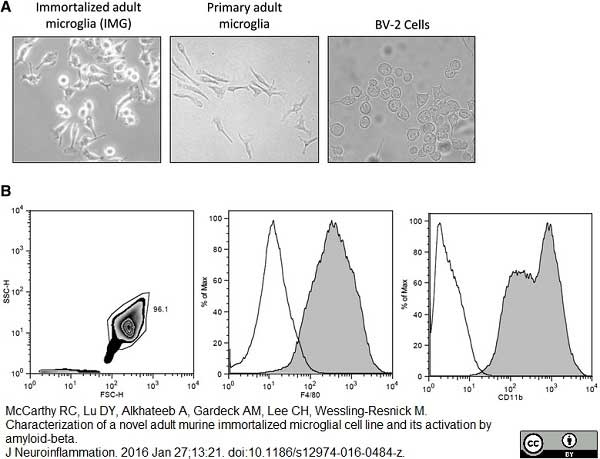 From: McCarthy RC, Lu DY, Alkhateeb A, Gardeck AM, Lee CH, Wessling-Resnick M.
Characterization of a novel adult murine immortalized microglial cell line and its activation by amyloid-beta. J Neuroinflammation. 2016 Jan 27;13:21. Rat anti Mouse CD11b antibody, clone M1/70.15 (MCA74G) used for identification of CD11b expressing cells in murine sciatic nerves by immunofluorescence on cryosections. Overexpression of ERp57 in transgenic mice increases axonal regeneration after peripheral nerve injury. (A) Non-Tg and Tg-ERp57 mice were damaged and sciatic nerves were extracted at 7, 11 and 14 days post-injury (dpi). Transversal semi-thin sections were obtained from the distal region and remyelinated axons (white arrows) and degenerated myelins (black arrows) were analyzed. (B) Quantification of remyelinated axons and (C) degenerated myelin density was measured at 7, 11 and 14 days post-injury. (D) Tg- ERp57 and Non-Tg sciatic nerves were processed for immunofluorescence in uninjured conditions and at 14 dpi. Sciatic nerves were analyzed for MBP (red), Cd11b (green) and nuclei were stained using DAPI (blue). (E) The staining density for Cd11b was quantified 14 days after injury (right panel). Data is presented as mean ± S.E.M. * p <0.05, ** p < 0.01, *** p <0.001. For histological analysis, statistical differences were obtained using a student's t-test (n = 3 animals per group). Scale bar: 20μm. Functional Role of the Disulfide Isomerase ERp57 in Axonal Regeneration. ERp57 overexpression reduces axonal degeneration. (A) Electron microscopy of Non-Tg and Tg-ERp57 uninjured and 14 days-damaged nerves. In uninjured conditions white arrowheads indicate axoplasm of myelinated fibers, black arrowheads, compact myelin sheaths and asterisks, unmyelinated fibers. At 14 days post-injury black arrows indicated degenerated myelins and white arrows, remyelinated axons. Scale bar: 4μm. 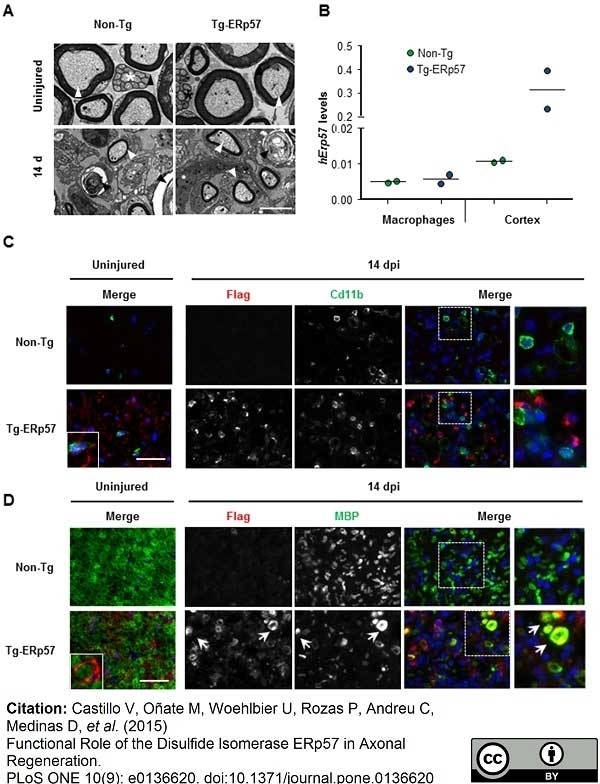 (B) hERp57 mRNA levels were determined in macrophages isolated from alveoli of Non-Tg and Tg-ERp57 mice after cell sorting of Cd11b-positive cells using real-time PCR (n = 2 per group). Cortex tissue from these animals was used as positive control. (C) Non-Tg and Tg-ERp57 mice were damaged and sciatic nerves were extracted at 14 days post-injury. Contralateral uninjured nerves were used as control. Transversal slides were processed for immunofluorescence for FLAG (red), MBP (green) and DAPI (blue) to identify Schwann cells. (D) Animals described in C were used for immunofluorescence to stain FLAG (red), Cd11b (green) and DAPI (blue) to analyse the infiltrating macrophage population. At the right panels, magnifications of indicated areas are shown. Scale bar: 20 mm. In B data are shown as mean. Rat anti Mouse CD11b antibody, clone M1/70.15 (MCA74GA) used for evaluation of macrophage infiltrates in murine ear tissue sections by immunohistochemistry on formalin fixed, paraffin embedded samples. Protective effect of bvPLA2 on macrophage infiltration in DFE/DNCB-induced mice via CD206. The ear tissue sections obtained from wild-type (WT) mice (A) or CD206-deficient mice (CD206−/− mice) (A) were stained with IHC (magnification ×200). Arrows indicate infiltrated macrophages. 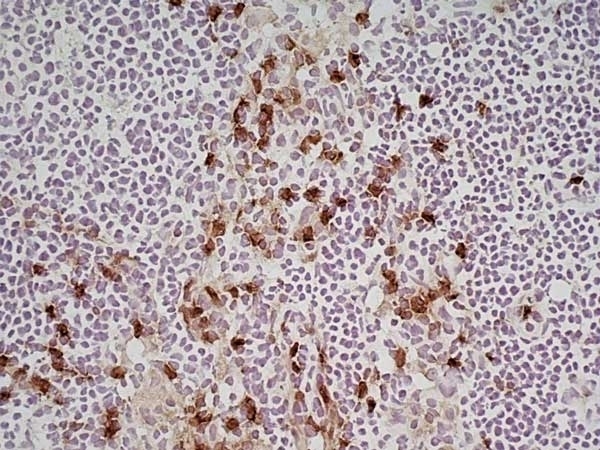 The macrophage cell number count graph on the IHC stained sections (B). CON: normal control, AD: DFE/DNCB treatment, and AD + bvPLA2: DFE/DNCB treatment + bvPLA2 treatment. (*** p <0.001 versus Control; NS, ## p <0.01 versus AD). 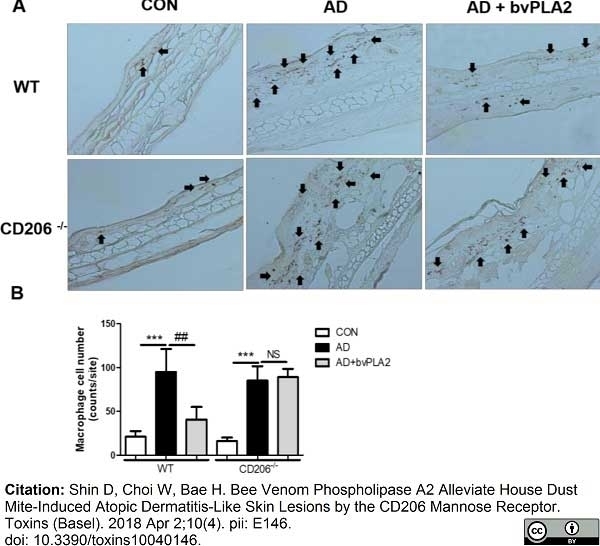 From: Shin D, Choi W, Bae H.
Bee Venom Phospholipase A2 Alleviate House Dust Mite-Induced Atopic Dermatitis-Like Skin Lesions by the CD206 Mannose Receptor. Toxins (Basel). 2018 Apr 2;10(4). pii: E146. Rat anti Mouse CD11b antibody, clone M1/70.15 recognizes the murine CD11b cell surface antigen also known as the alpha M integrin chain or MAC-1, a differentiation antigen expressed by granulocytes, monocytes, NK cells and tissue macrophages. The expression of CD11b increases during monocyte maturation and expression levels vary on tissue macrophages. Peritoneal macrophages are reported to express higher levels of CD11b than splenic macrophages. Rat anti Mouse CD11b antibody, clone M1/70.15 has been reported to block iC3b binding to its receptor (Beller et al. 1982). Rat anti Mouse CD11b antibody, clone M1/70.15 has been reported to as being suitable for use on PLP fixed paraffin embedded tissue but has not been tested for use on formalin fixed tissue (Whiteland et al. 1995). This product is routinely tested in flow cytometry on mouse peritoneal macrophages. T cell enriched splenocytes from B10 mice. 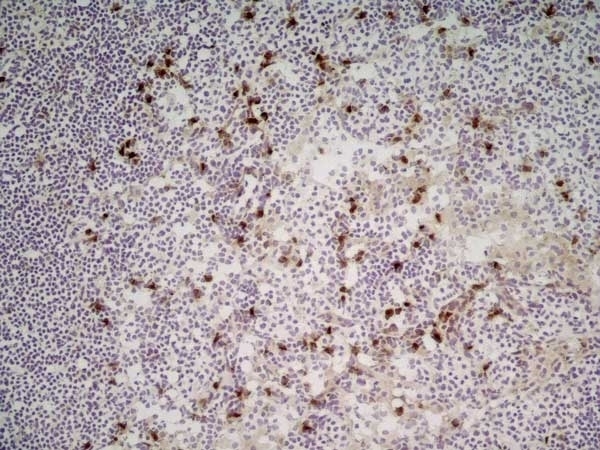 Spleen cells from immunised DA rats were fused with cells of the NS1/1.Ag4.1 mouse myeloma cell line. This product is photosensitive and should be protected from light. Should this product contain a precipitate we recommend microcentrifugation before use. The Fc region of monoclonal antibodies may bind non-specifically to cells expressing low affinity Fc receptors. Non-specific FcR binding may be reduced by using SeroBlock FcR reagent. The Fc region of monoclonal antibodies may bind non-specifically via the Fc region to cells expressing low affinity Fc receptors. Non-specific FcR binding may be reduced by using SeroBlock FcR reagent. Springer, T. et al. (1978) Monoclonal xenogeneic antibodies to murine cell surface antigens: identification of novel leukocyte differentiation antigens. Eur J Immunol. 8 (8): 539-51. Springer, T. et al. (1979) Mac-1: a macrophage differentiation antigen identified by monoclonal antibody. Eur J Immunol. 9 (4): 301-6. Beller, D.I. et al. (1982) Anti-Mac-1 selectively inhibits the mouse and human type three complement receptor. J Exp Med. 156 (4): 1000-9. Welt, F.G. et al. (2000) Neutrophil, not macrophage, infiltration precedes neointimal thickening in balloon-injured arteries. Arterioscler Thromb Vasc Biol. 20 (12): 2553-8. Terrando, N. et al. (2010) The impact of IL-1 modulation on the development of lipopolysaccharide-induced cognitive dysfunction. Crit Care. 14 (3): R88. Redensek, A. et al. (2011) Expression and detrimental role of hematopoietic prostaglandin D synthase in spinal cord contusion injury. Brochard, V. et al (2009) Infiltration of CD4+ lymphocytes into the brain contributes to neurodegeneration in a mouse model of Parkinson disease. J Clin Invest. 119: 182-92. Chinnery, H.R. et al. (2010) Novel characterization of monocyte-derived cell populations in the meninges and choroid plexus and their rates of replenishment in bone marrow chimeric mice. J Neuropathol Exp Neurol. 69: 896-909. Ferger, A.I. 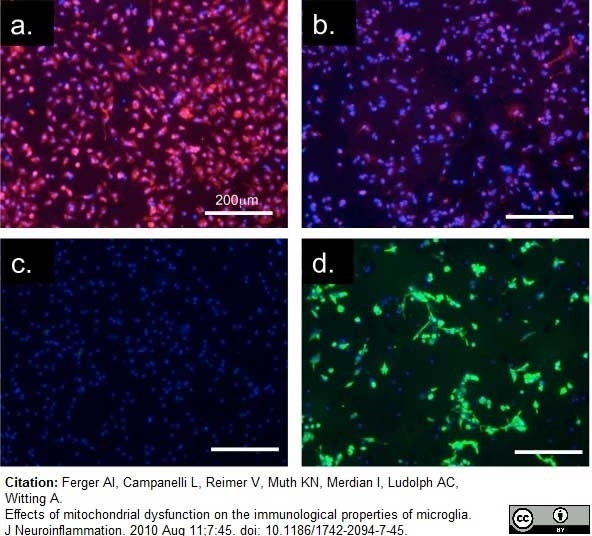 et al (2010) Effects of mitochondrial dysfunction on the immunological properties of microglia. Gales, A. et al (2010) PPARgamma controls dectin-1 expression required for host antifungal defense against Candida albicans. PLoS Pathog. 6 : e1000714. Geier, H. and Celli, J. (2011) Phagocytic Receptors Dictate Phagosomal Escape and Intracellular Proliferation of Francisella tularensis. Ghasemlou, N. et al. (2010) Mitogen-activated protein kinase-activated protein kinase 2 (MK2) contributes to secondary damage after spinal cord injury. Huang, Q.Q. et al (2008) Role of H2-calponin in regulating macrophage motility and phagocytosis. J Biol Chem. 283: 25887-99. Hudcovic, T. et al (2009) Monocolonization with Bacteroides ovatus protects immunodeficient SCID mice from mortality in chronic intestinal inflammation caused by long-lasting dextran sodium sulfate treatment. Kanu, N. et al. (2010) The ATM cofactor ATMIN protects against oxidative stress and accumulation of DNA damage in the aging brain. J Biol Chem. 285: 38534-42. Kapturczak, M.H. et al (2004) Heme oxygenase-1 modulates early inflammatory responses: evidence from the heme oxygenase-1-deficient mouse. Am J Pathol. 165: 1045-53. 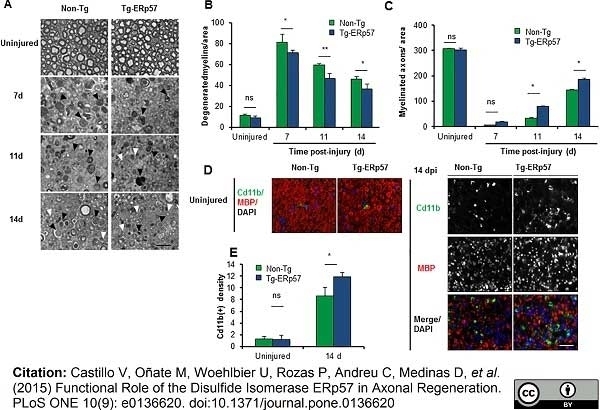 Kroner, A. et al (2010) Ectopic T-cell specificity and absence of perforin and granzyme B alleviate neural damage in oligodendrocyte mutant mice. Am J Pathol. 176: 549-55. L'Episcopo, F. et al. (2010) Combining nitric oxide release with anti-inflammatory activity preserves nigrostriatal dopaminergic innervation and prevents motor impairment in a 1-methyl-4-phenyl-1,2,3,6-tetrahydropyridine model of Parkinson's disease. Samanta, J. et al. (2010) Noggin protects against ischemic brain injury in rodents. 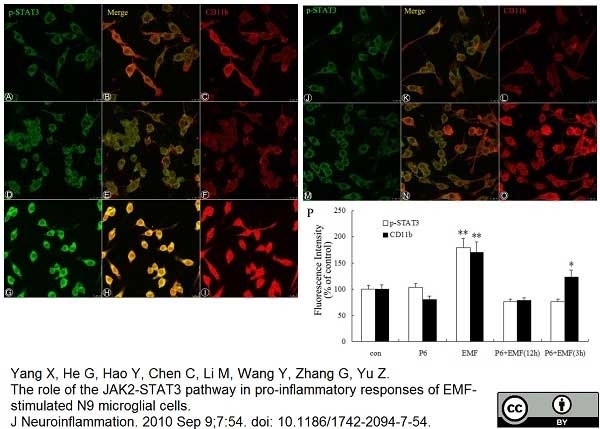 Yang, X. et al (2010) The role of the JAK2-STAT3 pathway in pro-inflammatory responses of EMF-stimulated N9 microglial cells. Kondo, Y. et al. (2011) Macrophages counteract demyelination in a mouse model of globoid cell leukodystrophy. Macrez, R. et al. (2016) Neuroendothelial NMDA receptors as therapeutic targets in experimental autoimmune encephalomyelitis. Amantea, D. et al. (2016) Neuroprotective Properties of a Macrolide Antibiotic in a Mouse Model of Middle Cerebral Artery Occlusion: Characterization of the Immunomodulatory Effects and Validation of the Efficacy of Intravenous Administration. Werneburg, S. et al. (2016) Polysialylation and lipopolysaccharide-induced shedding of E-selectin ligand-1 and neuropilin-2 by microglia and THP-1 macrophages. Certo, M. et al. (2015) Activation of RXR/PPARγ underlies neuroprotection by bexarotene in ischemic stroke. Chen, Z.Z. et al. (2016) Memantine mediates neuroprotection via regulating neurovascular unit in a mouse model of focal cerebral ischemia. Rich, M.C. et al. (2016) Site-targeted complement inhibition by a complement receptor 2-conjugated inhibitor (mTT30) ameliorates post-injury neuropathology in mouse brains. McCarthy, R.C. et al. (2016) Characterization of a novel adult murine immortalized microglial cell line and its activation by amyloid-beta. Jones, R.S. et al. (2015) Inhibition of JAK2 attenuates the increase in inflammatory markers in microglia from APP/PS1 mice. Neurobiol Aging. 36 (10): 2716-24. Amantea, D. et al. (2016) Azithromycin protects mice against ischemic stroke injury by promoting macrophage transition towards M2 phenotype. Exp Neurol. 275 Pt 1: 116-25. Bains, M. & Roberts, J.L. (2016) Estrogen protects against dopamine neuron toxicity in primary mesencephalic cultures through an indirect P13K/Akt mediated astrocyte pathway. Ji, J. et al. (2015) Iptakalim protects against ischemic injury by improving neurovascular unit function in the mouse brain. Clin Exp Pharmacol Physiol. 42 (7): 766-71. Kim, B.W. et al. 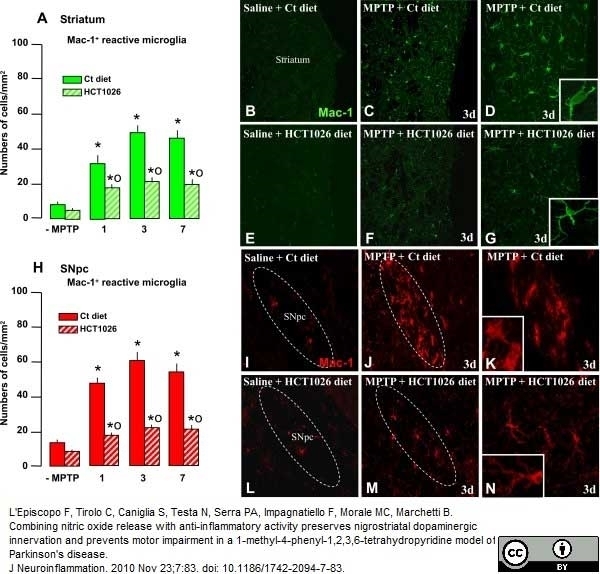 (2015) α-Asarone attenuates microglia-mediated neuroinflammation by inhibiting NF kappa B activation and mitigates MPTP-induced behavioral deficits in a mouse model of Parkinson's disease. Nishikawa, K. et al. (2015) Resveratrol increases CD68⁺ Kupffer cells colocalized with adipose differentiation-related protein and ameliorates high-fat-diet-induced fatty liver in mice. Mol Nutr Food Res. 59 (6): 1155-70. Jiang, H. et al. (2017) Dense Intra-adipose Sympathetic Arborizations Are Essential for Cold-Induced Beiging of Mouse White Adipose Tissue. Cell Metab. 26 (4): 686-692.e3. Zhang, J.C. et al. (2017) Prophylactic effects of sulforaphane on depression-like behavior and dendritic changes in mice after inflammation. J Nutr Biochem. 39: 134-44. Petković, F. et al. (2017) Reduced cuprizone-induced cerebellar demyelination in mice with astrocyte-targeted production of IL-6 is associated with chronically activated, but less responsive microglia. Shin, D. et al. (2018) Bee Venom Phospholipase A2 Alleviate House Dust Mite-Induced Atopic Dermatitis-Like Skin Lesions by the CD206 Mannose Receptor. Toxins (Basel). 10 (4)Apr 02 [Epub ahead of print].